You spend a lot of time thinking about how your business can work more efficiently. You may not realize how much your flooring affects the look and daily function of your business. With epoxy floor coating, you provide additional protection for your floor that keeps your employees and clients safe, without having to compromise on style. Like any business, you have high-traffic areas that are hard to keep clean and protect from damage. You need to take action now before you have to make expensive repairs. Epoxy floor coating provides the level of protection that businesses need to avoid damage from impacts, chipping, chemicals, stains and surface abrasion. The epoxy acts as a barrier, keeping the floor from shouldering the impact of regular wear and tear. Additional anti-dusting agents prevent dust from collecting on the floor, which keeps your floor looking professional, shiny and new. 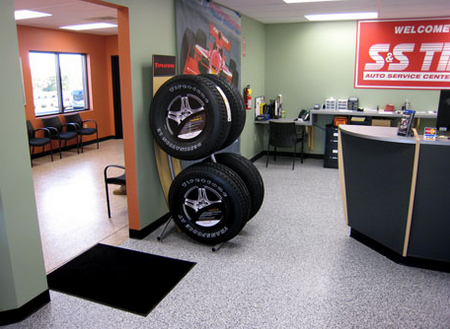 Whether you own a garage as a mechanic or you own a restaurant, you need flooring that is moisture-resistant. Spills happen, and when they do, the concrete takes the hit. Over time, spills can pass through the concrete to the ground outside, which is not environmentally-friendly. Epoxy floor coating changes this reality for you. When one of your employees or clients spills something on the floor, you do not have to rush to the scene to clean it up before there is a permanent, unsightly stain. The finish prevents absorption so that someone can easily wipe away the mess with no trace left. This also helps to prevent people from slipping on a greasy floor. 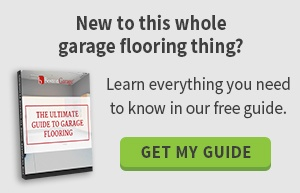 While garage flooring is a natural complement to any custom garage organization plan, it is also a pleasant-looking one. You would be surprised to see all the different colors and topcoat options you have in epoxy floor coating. You can select from solid colors or acrylic flake designs that perfectly match your brand. That way, your floor fits with your business décor, and helps you put your best foot forward. Choose from charcoal gray to safety yellow, and every color in between. The decision to get epoxy floor coating for your business is a simple one. Once you have it installed, you will wonder how you survived a day without its easy-to-maintain surface. When you are ready to bring your business a little more convenience and class, request a free mailed idea brochure.